This refreshing, crisp and clean Skin Glow Juice, when consumed regularly, will help you get smooth, soft and glowing skin. 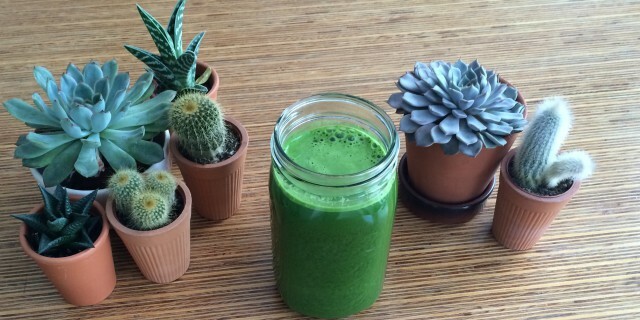 This juice is rich in chlorophyll, a powerful antioxidant, which is responsible for the green pigment in this juice. Chlorophyll helps the transport of oxygen to your muscles, tissues, organs, brain and cells. It gives you more energy, increases focus and helps detoxify the body, removing built-up toxins, which can manifest in skin problems such as acne, pimples or a grey and dull skin tone. We tend to forget that our skin is one of the largest organs of detoxification. When waste is not properly removed from our bodies, it can get stuck in the pores of our skin. This Skin Glow juice supports the removal of waste from your body leaving you with healthy, clear and smooth skin. It also helps to fight off free radicals, which cause damage to our cells and speed up our ageing process. The antioxidants in this green juice protect your cells from harmful external influences, as sunshine and air pollution, but also from harmful internal influences as infections and inflammation. This is crucial for maintaining a healthy, youthful glow. For a healthy, clear skin it is also important to keep your body hydrated. This cucumber and celery in this juice are great for hydrating skin due to their high water content. Cucumber is also rich in minerals like magnesium and silica which play an important role in skin health. So get your skin glow on with this delicious and refreshing Skin Glow Juice! Juice all produce and enjoy!